This is a great Bruckner 6. 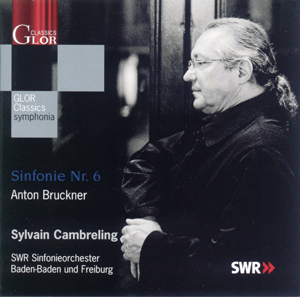 It is one of three Bruckner recordings from Cambreling and the SWR Baden-Baden und Freiburg Orchester. The others, Symphonies 4 and 9, both have their merits, but this 6th is the best of them. Cambreling is a very solemn Brucknerian, which can lead to excessive dourness elsewhere, but here gives a welcome sense of conviction and purpose. The opening is a case in point. Those trumpet fanfares a few pages in give lighter textures than in many of Bruckner’s expositions – still not light as such, but light for Bruckner. Cambreling maintains a clarity of texture throughout all these brass passages, and in the following sections of interplay between the woodwind and the strings. But he also maintains a keen sense of purpose throughout, so the music has all the solemnity of the 8th or 9th Symphonies’ first movements, which combines well with the clearer textures of the 6ths lighter scoring. My one complaint is with the lack of atmosphere in the quieter sections. That focus on direction and purpose often mean that Cambreling takes an excessively functional approach to the quieter music. This is most apparent in the middle movements. The Adagio is slightly faster than other recordings I’ve heard, but considerably more foursquare. It is a controlled, almost calculated, reading with little very little rubato. And the caesura breathing spaces between the phrases often feel slightly rushed. On the other hand, the conductor’s tight control of the ensemble allows him to create chamber music precision in the woodwind ensemble passages. The Scherzo also risks being too matter of fact. This is the one movement where Cambreling’s solemnity becomes counterproductive. It is one of the few movements in Bruckner where a sense of humour is required to pull off the extreme contrasts between will-o-the-wisp woodwind and farcically bombastic brass. Cambreling doesn’t see it that way all, and presents the movement as if it were the Scherzo of the 9th, all weight and drive. These are small complaints though. Cambreling’s interpretation is both coherent and passionate, essential properties that are all too rare among Bruckner interpreters. He also has a real ear for detail. He, the orchestra and the recording team should all be congratulated for the crispness of the sound and the extent to which details of the score are articulated. Going back to the Scherzo, the interplay of the raindrop descending figures between the flute and the pizzicato strings is excellent, evenly balanced yet timbrally distinct, a delight! I’m also impressed with the bass in the mix, with the lower strings, the lower brass and the timpani coming through with crisp precision, and with the power and weight that Cambreling’s focussed interpretation requires. The orchestra must know this piece like the back of their hands, but they really keep it fresh, and the playing of every section stands up well to the scrutiny of the superior audio. So what next for Cambreling and his SWR forces? This recording demonstrates a distinctive and passionate approach to Bruckner’s music, both sensitive to its Romantic expression and keenly aware of its need for architectural structuring. How about a recording of the 5th Symphony, that could be a real triumph.